As the first phase of the Mattala airport project in Hambantota gets underway there are allegations of animals being killed for food by site workers and large tracts of land being set ablaze driving elephants into human habitation and other environmental issues. Heads but no bodies, skins and scales strewn around while in the backdrop massive forest fires are visible that usually Sri Lankans see only on television. This is not happening in some far off foreign land but amidst an area which has been in the spotlight for several weeks now, for its showpiece harbour and proposed second international airport. 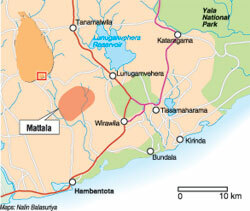 What is taking place at Mattala in Hambantota as 800 hectares are cleared under the first stage of the airport project? The ground reality is sending shock waves not only among perturbed environmentalists but also the people of the area. There is a massacre of anything that moves, be it four-legged, two-legged or no-legged for food, said a concerned conservationist, pointing out that mouse deer, snakes, frogs and even the pangolin (scaly ant-eater or kedellawa) are ending up on the plates of the employees of the foreign company mandated to carry out the Mattala airport project. The pangolin, the Sunday Times learns, falls under the ‘Near Threatened’ category of the IUCN’s Red List due to poaching while their numbers are also decreasing because they get caught in traps and snares easily. A set of photographs from within the site in the possession of the Sunday Times says it all. No animal has been spared, with conservationists charging that not only are they putting into coking pots all those animals which have got trapped within the area enclosed for clearing but also getting local workers to bring in other creatures as well. The project was launched in November 2009 with much fanfare after Acting Chairman of the Central Environmental Authority Chairman Sunil Wimalasuriya on May 4, 2009 granted approval for the ‘Proposed development of airport at Mattala’ by the Airport and Aviation Services (Sri Lanka) Limited (AASL), after studying the Environmental Impact Assessment Report (EIAR) and laying down certain terms and conditions. AASL, in turn, has entrusted the task to a foreign company. However, the Sunday Times understands that most of the terms and conditions are being and continue to be flouted. A strong letter of protest against these violations, dated July 14 has been sent by Bandu Ranga Kariyawasam of the Green Movement to the Chairman of the Central Environmental Authority (CEA) detailing the large-scale slaughter of animals and the brisk business that illegal meat-sellers are engaged in. However, when the Sunday Times contacted CEA Chairman Charitha Herath he gave an assurance that though some non-governmental organizations were making such allegations, no such things were taking place at Mattala. When asked whether the CEA had an officer on site, he answered in the negative but explained that they visit the site for inspection on and off. The foreign company has demarcated the 800 hectares to be developed under stage I of the project with electric fencing, not starting from one side and letting the wild animals leave but all sides, leading to a large number of animals getting trapped there, a conservationist lamented, alleging that reports indicate that this fate has befallen a few elephants as well. Do you think elephants will leave the area through the main gate or the rear gate with so many people around, he asked, stressing that the fencing should have been done from one area, allowing time and space for the animals to move out. To add to the troubles of the animals another wire-mesh fence has also been erected within the electric fencing, entrapping them securely. The CEA’s specific conditions under ‘wildlife aspects’ are very clear, stipulating that the AASL conduct a biodiversity baseline survey of the area prior to clearing/construction work followed by a detailed wildlife management plan using wildlife experts; allocation of funds for an Elephant Conservation Area surrounding the project site; erection of an electric fence “to prevent wild animals entering the project site”; and electric fences around the villages located within the proposed Elephant Conservation Area in consultation with the Department of Wild Life Conservation (DWC). Although, there was to be a 500-metre corridor next to Malala Ara for some of the elephant herds to access their home range, the fencing had been put up right on the bank of the Malala Ara, the Sunday Times learns, with only about 100 metres being released after much pressure from the CEA, DWC and the District Secretariat officials. There are more than 300 elephants in the airport development area, it is learnt. The other animals trapped within this area, of course, end up in the cooking pots of the foreign workers, another conservationist said, while locals are also providing venison from outside at a cost of Rs. 700 per kilo. When foreigners come to our sites, we should issue them guidelines based on the Fauna and Flora Protection Ordinance in their own language, he said. 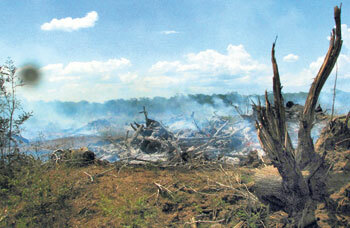 Meanwhile, the workers are clearing and setting ablaze large tracts of land, it is learnt, although the CEA’s terms and conditions state that “any merchantable trees within the project area identified for removal should be enumerated and handed over to the State Timber Corporation under the supervision of the Forest Department”. This is not happening, said Mr. Kariyawasam of the Green Movement, suggesting that without burning the other smaller brush, it could be handed over to the villagers around the site, as they need firewood. While stressing that no one is opposed to development, conservationists point out that it should be carried out minimizing the impact on the environment and addressing the issues that arise. Forward thinking and planning are a must, an elephant lover said, citing numerous examples where development has taken place without considering the repercussions and the human-elephant conflict has accelerated, leaving the DWC to tackle the problem later. Their simple plea is: Do the airport project, but do it right from the beginning, addressing the environmental issues. Rejecting the allegations, a project official stressed that all terms and conditions were being adhered to by the AASL. With regard to charges that valuable timber trees were being destroyed, he said that the Forest Department marked the relevant trees, after which the Timber Corporation removed them. “We even paid Rs. 300,000 to the Forest Department to do so,” he said. The AASL also asked the people to take the firewood but they delayed to come in and the Timber Corporation appointed a private contractor to remove that as well, he explained. When asked about the 500-metre elephant corridor, he said that 120 metres have been demarcated on one bank of the Malala Ara, without jeopardizing the safety of the air passengers. The other bank of Malala Ara can be used by the elephants. “We have also advised the on-site workers of what food habits they need to follow,” he assured. Inviting the Sunday Times to visit Mattala, he said they were very conscious of the environmental aspect because it was to be an eco-friendly airport. British Council unveils Mythil’s secret!